And no, it’s not wine. It’s also not coffee anymore, my friends! I still drink plenty, sometimes three cups a day, but not in the afternoon. A girl needs her rest when the little guy decides to go to sleep. I also don’t drink much soda these days. What a difference it makes! I posted a while back about mixing sparkling wine with Trader Joe’s peach pops made of real fruit and sweetened with only grape juice for an easy Bellini. 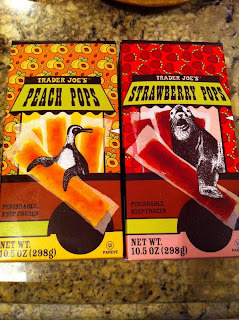 Well, now my new favorite healthy daytime beverage is made of Trader Joe’s strawberry pops mixed with sparkling water to get you a real fruit spritzer. It is so refreshing, low in calories and the perfect substitute for sugary soda, right? They say (don’t ask who they is… I have no idea) that most fatigue is really just from dehydration. So, sip up! I’m a dork and like to sip it out of a champagne flute in my home office. Who do I have to impress you may ask? Just me! I love it! Place the strawberry pop in the glass and pour sparkling water of your choice. My current favorite is H2Oh! because it’s super inexpensive at our grocery store. Of course, you could go extra fancy and add Perrier or some other “nicer” sparkling water. Be sure to stir it up for a while before drinking. Then, just enjoy! What’s your favorite healthy beverage? What do you drink too much of that you need to eliminate? One Response to "My healthy afternoon pick-me-up"
Love this idea!! Nice and summery (once it finally comes back around)!